You can’t know where you are going, if you don’t know where you have been. The security remedies of today differ from the remedies available five or ten years ago. The good news is that as technology has evolved, and costs have gone down. For example, consider the cost of a video surveillance system 15 years ago as compared to today’s price tag. There has be a significant shift from the reliance on security personnel to reliance on many divergent and evolving technologies. The security officer of today has become the glue that synergizes the effectiveness of a wide range of technologies. There have also been substantial decisions to be made as to how to best leverage security assets in a manner that ensures that the whole is greater than the sum of the parts. Parenthetically, there have also been significant shifts in the ambient threat environment. For example, the proliferation of workplace violence in hospitals, schools and shopping malls. These shifts have had an impact in the defining of a reasonable standard of care. More and more, the reasonable standard of care is being shaped by tort law. Security driven litigation, and the case-law that has evolved, in turn has impacted to totality of security planning, especially those enterprises that afford public access. A significant amount of security design, during the planning phase, is driven by the desire to avoid the liability claims, of inadequate security. As forensic security experts: We can assert, with almost universal certainty, that the cost of most security litigation is far more costly than conducting a comprehensive security assessment, and the resultant relevant security program. There are both industry specific components to the ambient threat environment, as well as location specific components (variations in the ambient crime environment). Industry specific recognition acknowledges the security variances of verticals, such as hospitals, shopping malls and industrial plants, as well as differences within those verticals. The threat environment is in part vertical-specific, as well in part industry specific. The goal of ensuring that each security program meets the reasonable standard of criteria, should not be the only driving force behind the determination of the efficacy of each security program. Additionally. loss prevention is not exclusively about liability. Loss prevention is also applicable to the security of plant and equipment, as well as inventories and supplies, as well as proprietary information, and most importantly, people. Therefore, the application of technology and security personnel must be driven by identified and quantifiable need. Good security, is simply just good business. A positive emerging trend for many industries, is the application of Crime Prevention Through Environmental Design.Optimally, the best security design process begins pre-construction, especially when CPTED is under consideration. This, by no means, is intended to imply the CPTED can not be applied to the built environment. We believe that CPTED should be a component, worthy of consideration for every security assessment. Among other considerations, CPTED is cost-efficient, effective and will significantly improve almost any security operation. 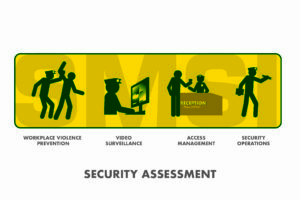 Periodic security assessments are also essential, especially for those businesses that cater to the general public. The application of security technology must be relevant, and need driven, as opposed to mere window dressing. Security assessments should not only fit the needs of the management team, but should also include the participation of rank and file employees.